Earlier this week I reviewed a darkly hilarious Kurt Vonnegut satire on stage in New York. The other two plays I saw last weekend are powerful dramas about family tragedy. They aren’t comedies, although the audience at one play seemed to find humor where I found sadness. Both plays are in long runs. 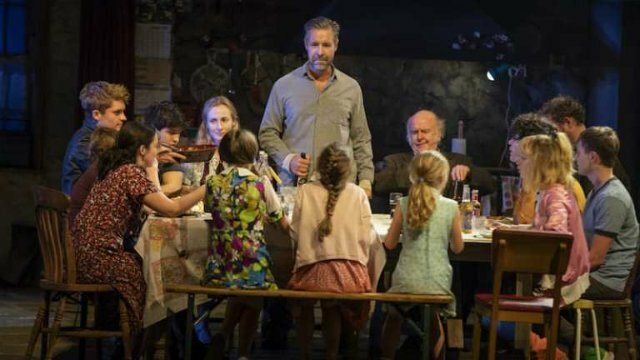 The Ferryman by Jez Butterworth continues through February 17 and Kenneth Lonergan’s The Waverly Gallery runs until January 27. I’m heartbroken that I couldn’t get a ticket to The Girl From the North Country, a play by Conor McPherson based on Bob Dylan’s song canon, which closes December 23. If you’re going to New York and want expert suggestions on plays to see, check out the latest version of the New York Times Critics Picks—just search that term. Here’s the current version. You get a summary review of each play and a link to the full Times review with run times, ticket links, etc. The Ferryman requires a master director because it’s a deeply layered play with a cast of 22, which includes several children. Its background is the story of the hunger strike by Republican prisoners during the Troubles in Northern Ireland in 1981. Quinn Carney (Paddy Considine), a reformed IRA activist, and his ailing wife Mary (Genevieve O’Reilly), have a large brood of children of their own. His sister-in-law Caitlin (Laura Donnelly), widowed because Quinn’s brother disappeared after Quinn defected from the IRA, also lives with them, with her son Michael (Fra Fee). Several relatives of the senior generation also live in the Carney farmhouse in County Armagh, so we can appreciate the humor of Uncle Patrick (Mark Lambert), the radical political rants of militant Aunt Patricia (Dearbhla Molloy) and the occasional dreamlike stories of Aunt Maggie Far Away (Fionnula Flanagan). Tom Kettle (Justin Edwards), a simple handyman, visits with a rabbit in his pocket and reminds one of Lenny in Steinbeck’s Of Mice and Men. And yes, there’s wild life on stage: rabbits, a goose and even a baby. (Well-behaved on the night I saw the play, but I would think most directors would prefer to cast a wrapped doll-figure). There’s sexual and romantic tension between Quinn and Caitlin too. There are many story lines and themes in The Ferryman as it takes place over a 24-hour period. The title is an allusion to Charon, the ferryman who takes the living to the world of the dead across the river Styx. Irish history figures prominently in the story, so you may want to brush up on the modern history of those troubled countries. As the play begins, the family is preparing for their annual harvest celebration, but then a visitor from the past arrives to interrupt the story and add violence and political intrigue. In act one, I had a bit of trouble getting used to the Irish dialects, but the act is a long and important introduction to the various threads of the story. Later the body of Caitlin’s husband is found and the political story builds to an explosive ending. The play—at the Bernard B. Jacobs Theatre on 45th Street—runs 3.5 hours with one intermission. Most of the outstanding cast transferred from the London production at the Gielgud Theatre in the West End, which premiered at the Royal Court. The Ferryman won 2018 Olivier Awards for Best New Play and Best Director, plus several Evening Standard Awards and a U.K. Critics’ Circle Award for Best New Play. This production of Kenneth Lonergan’s 2000 play at the John Golden Theatre (next door to the Jacobs) has received a great deal of attention because it stars Elaine May in her first stage appearance in decades. (I last saw her live in a storefront cafe on the north side, when the Compass Players moved north and before their transition to Second City.) She’s now 86 years old and handles the role of Gladys Green, the art gallery owner slipping into dementia, with great skill and warmth. The performances of Lucas Hedges as her grandson Daniel and Joan Allen as her daughter Ellen are especially strong. David Cromer plays Howard Fine, Ellen’s husband and Daniel’s stepfather; he has a shorter history with Gladys and is less understanding. Lila Neugebauer’s direction is careful and sympathetic. The play is set between 1989 and 1991 in Gladys’ apartment and gallery in the Village and in the Fine home on the upper west side. Gladys was an intellectual and political activist in her younger years and she chatters constantly about her life. She takes great pleasure in working at her gallery, even though she doesn’t seem to have any customers. She does help artists; Michael Cera plays a young artist living in his car. Gladys befriends him, hangs his extraordinarily detailed family paintings in the gallery, and lets him sleep in the back room. 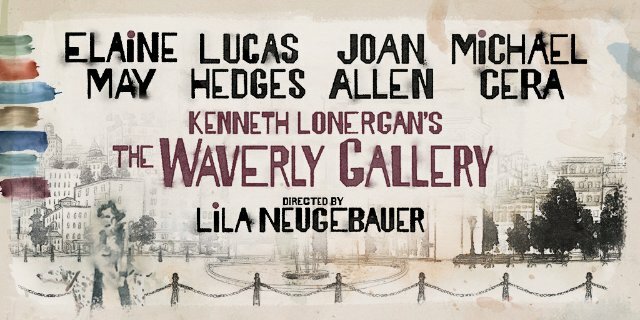 The Waverly Gallery is a memory play in the theatrical sense, but it’s really a play about memory loss and what that means to the individual in decline as well as those around her. Daniel is the story’s narrator. He and Gladys have a sweet and fond relationship, despite Daniel’s irritation with Gladys’ forgetfulness. He gives up trying to explain that he’s a speechwriter for a government agency because she insists he’s a newspaper reporter. Daniel lives in an apartment in Gladys’ building and as her decline increases and she often becomes disoriented, he is more and more frustrated and unable to deal with her situation. Lonergan says the play was inspired by his own grandmother’s last years and indeed, the scenes between Gladys and Daniel are painfully realistic. Although there is humor in Gladys’ forgetfulness in the early scenes, I found the giddy laughter of the audience to be rather sad. Talking to people of my generation at intermission, we agreed that you would have to be young to find The Waverly Gallery funny. We found it was about us and possibly about our own friends or relatives. Despite that caveat, this superb production is well worth seeing because of the excellent writing and direction and the sterling performances. Lonergan is also author of the scripts for Lobby Hero and This Is Our Youth, and of major screenplays including You Can Count on Me, Margaret and Manchester by the Sea. The Waverly Gallery, which runs two hours with one intermission, premiered at the Williamstown Theater Festival in 1999 and ran on Broadway in 2000 with Eileen Heckart starring as Gladys.